Come join our 17+ week Moore’s MarinesTM Marine Corps Marathon Training Program targeting the Marine Corps Marathon (and training for the Baltimore Marathon and other marathons, too)! Our target race is the Marine Corps Marathon (“MCM”). If you want to run Baltimore or another marathon let us know and we can adjust the plans for you. Regardless of which race you target, you must sign up ON YOUR OWN. This program does not give you entry into any race. 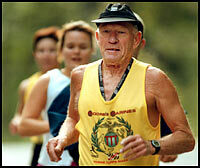 Our marathon training program is named for longtime Striders member Ben Moore, who originated the marathon training program in 1979 for the Annapolis Striders and trained many to run the Marine Corp Marathon. Able to run 10 miles comfortably (comfortable, conversational pace). The training programs ramp up mileage quickly. It is expected that you can already run 10 miles and have a base weekly mileage of at least 25 miles. If you cannot, the Striders offer other training classes to help you reach 10 miles, such as the summer’s Annapolis 10 mile training. The minimum age for the Marine Corps Marathon is 14 (as of race day). Any minor who meets this age requirement may participate in the training program PROVIDED HE/SHE IS PARTICIPATING WITH A PARENT OR GUARDIAN (not just being dropped off and picked up, but actually running with the parent or guardian). We cannot be responsible for minors out on the training route. Annapolis Striders training classes are a free benefit for members. In order to participate in this training class, you must have a current membership. You may become a member or renew an existing membership online or by mail-in form. After signing up as a member (or if you are already a member), you must also register for the training with the registration method for the upcoming session below. Training coaches will not accept membership signups or training registrations in-person at training sessions. To complete the Marine Corp Marathon or other fall marathon. Includes: A detailed 17 week schedule. How to build up for the marathon, various pace charts, injury prevention and treatment, running safety, and keeping running fun. The B&A Trail has generously allowed us to hold this program on the trail. We must follow all B&A Trail rules. Information on trail running safety and parking will be provided. This training has concluded for the season. Please join us next time!